It is the 3rd anniversary of ROMA’s construction! Please join us for the start of a week long celebration - with the kickoff event of a general blessing of all of ROMA by the Collegia Religio Romana, to ensure the Gods favour of our City for another year. This will be immediately followed by the ROMA @ III Grand Ball, welcoming our regular Citizens and new visitors to another year of wonderful events and comraderie! Attention all scholars and history buffs! ROMA and the Scholastica Antiqua is proud to present a lecture by William Gide, official ROMA Chief Scribe - “The Indo-European Heritage in Greek and Latin Poetry.” Just as linguists are able to discover relationships between languages and show that, for example, Sanskrit and Welsh are actually distant relatives, we can also investigate the common poetic relationships in the literatures of these languages. In this talk we’ll look at some of the common themes and techniques that join the poetry of the classical world to everything from the Vedas in India to versified legal documents in old Ireland. The second lecture in our Scholastica Antiqua ROMA @ III series - Vestalis Maxima (Chief Vestal), Angelia Rees, will be presenting “Roman Religion and Practice”, a lecture on the basic structure and practices of the ancient Roman faith. The lecture will cover the Roman concept of “numina”, and household worship, as well as the more familiar Olympian Gods. Summer is over and the Ave Weekend events have started again! The Senate is graciously hosting this Ave Weekend party, so we can TGIF in the best ROMAn style! And *right after* that, the Legion has prepared for us a demonstration of the Battle of Zama (the final major battle of the Second Punic War) - showing the formations and tactics between Publius Cornelius Scipio Africanus and Hannibal’s armies - join us for this entertaining and educational recreation! Join us in the completely refurbished Theatre of Dionysus for a special ROMA @ III production of “Peace” by Aristophanes (translated and updated by Torin Golding). An anti-war play, Aristophanes wrote “Peace” to be a comedic, witty, and scathing theatrical assault on Athens’ (by this time) 10 year Peloponnesian War against the Spartans. The main plotline of the play is the intense desire of the citizens for relief from the miseries of war and the lengths one man goes to to achieve it. The play will immediately be followed by the ROMA LGBT & Amici party to celebrate beginning their second year in ROMA - with dancing, music, and good company all around! In Roman religion, the Lemuralia or Lemuria was a feast during which the ancient Romans performed rites to exorcise the malevolent and fearful ghosts of the dead from their homes. Though traditionally held in May, ROMA has moved this festival to coincide with the more modern celebration of Hallow’een, another day of ghouls and ghastlies. Our Lemuralia ritual will banish any malevolent spirits, both real & imagined, while welcoming the protective spirits of the Lares and beneficent ancestors. Our second event and the final ending to our ROMA @ III celebration is the ROMA Hallow’een Grand Feast - so break out your scariest or most fanciful costumes and come prepared for a spooky good time! We’ll have a contest for best costumes and Hallow’een trivia by Mickey James, both of which can earn you cash prizes! This is a life report from the opening of Jachmes Masala’s new Egyption exhibition that will introduce you to the finds at Gizah. No screenshots yet, sorry, I am on a crappy connectioon and a crappy machine atm, so I can’t take any screenshorts. I will supply some later. The exhibition is quite impressive, set into one of the famous Egyption pyramids. Don’t mess with the light settings, leave it in the dark and take a torch from the red box at the entry. Wear it and enter the darkness. You can walk around and looks at various exhibits, which are usually object, clicking on them will give you a notecard, the ownly downside: Some are only available in German so far, but more are supposed to be available in both languages soon..
As I type Jachmes is giving us a tour through the exhibition, mostly explaining how she designed the exhibition and why SL is especially useful for creating it. Jachmes will give tours through the exhibition (in English and German, afaik), she has a profound knowledge and I advice you to catch one, if you get a chance. If I get more datails, I will put them here. My site is worth $1781.2. I probably mentioned in one or the other blog entry that web to SL and SL to web communication is one of my main interests. So I was clearly delighted to read on Darien Caldwell’s blog that Linden Lab is about to start an open beta to test a new HTTP-IN functionallity. I used XML-RPC for one of my projects and it was an utter pain. I used email for another and discovered how unreliable email can be, if you use it to make two prims communicate, so I expect nothing less than a huge breakthrough, if HTTP-IN gets fully implemented. Darien must share this opinion, he calls it “the Next Big Thing” in his blog. It will make many existsing applications easier and hopefully more reliable to build and maintain. Probably it will create some brand new applications that link SL with the web. Alas, it often takes month or even a year or more for a new feature to make it from testing to standard implementation, but this will be one worth waiting for. I felt like the proverbial kid in a candy shop when I found this site featured on the SL showcase. During the work on my thesis about the potential use of Second Life for intercultural education I was sadened by all the potential I saw - and the few and often struggeling applications. 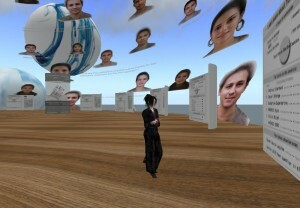 So I was excited to see a major project dealing with intercultural learning opening its gates in Second Life. The place mostly offers a quiz where you can answer questions on various cultures and some cross cultural topics, like intercultural communication or global teamwork. You will get an individual score for each test and there are highscores for the various tests and a global highscore on display. I experienced minor problems with one of the tests, it seems that communication channels from various quiz panels were messing with each other, but that was only a minor glitch which is acceptable so soon after the place opened to the public. All else the quizzes and the high score lists are a very nice idea and well done. 1/ You are not necessarily the best expert for your own culture. This even makes sense. I have very little formal knowledge about German cultural standards, it is mostly informal. So I rather asked myself: “What would I do here? How would I feel about it?” But it is very unlikely that my own standards and experiences exactly match the cultural norm. 2/ It made me more aware of many things that I simply take for granted and it never occured to me that it may be specific to Germany (e.g. marking pupils for the mistakes they made, not for correct answers). 3/ In those cases where the answer suprised me, either by being not what expected or pointing something out as typical German, it often felt like a real revelation. I never looked at it like that before, but it made so much sense. I take it as an indication that the questions and answers were indeed selected and phrased with a good measure of insight. I actually scored less on German culture (61%) than I scored in intercultural communication (82%), a test that actually mixed questions from various cultures. Does this make me a bad German? I had fun and think the place was well done. Still I think there may be even better ways to use Second Life as a leraning experieince for intercultural education insofar as the quiz could be done just as well on any website. In other words: It makes little use of specific options you can fidn in Second Life, and only in Second Life. But it is a very good start, professionally donen and surely helps to raise awareness of intercultural issues. Kzero published a very nice graph to give an overview over virtual worlds, existing ones and those in development. I seem to vaguely recall seeing something like this a while ago, I will search through my files, if I can still find it and if this is an update or old news presented as real news. Anyway it’s worth taking a look, if you want a good idea of how much there really exists outside of SL. Making videos in Second Life - I always liked watching them but felt like this might be something I do not have to try myself. But now that I will talk about Second Life at Dragon*Con, I know I better produce some nice videos, for I can’t risk to have nothing to show to people in case my internet connection fails, is too slow or there is an unexpected downtime. So I sat down, started searching the net, choose FRAPS as a recording tool and started shooting, editing, converting and … there it is. There is a lot I will make better in my next video, especially I underestimated the overlap I need for effects, but I wanted to keep this authentic, so here it is: My very first machinima. 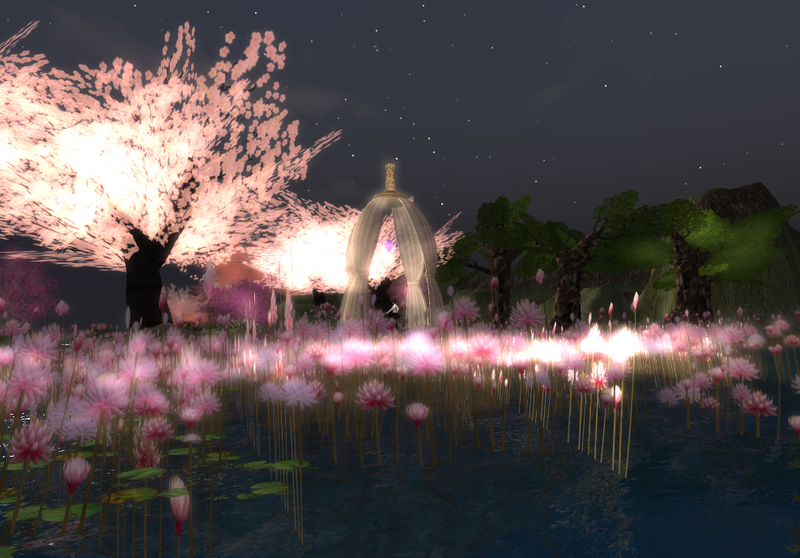 Shot at the beautiful Tempura sim, of course. I got confirmation that my panel on Second Life at Dragon*Con is ON! Dragon*Con is a huge comic, fantasy, anime, roleplaying, cosplay, godknowswhat convention that is attended by 30,000+ visitors each year.There are several different programming tracks running parallel and I will be talking about Second Life in the Electronic Frontiers Forum. The panel will be titles “Second Life - history and future” and is intended as a general interest panel. There will be another panel on legal aspects of virtual worlds that may be of interest. So if you live close to Atlanta or may like to join the madness, you should mark the Labor Day weekend (August 29th to September 1st). As mentioned on this blog before, I wrote my master’s thesis in intercultural education on “Second Life as an Emerging Platform for Intercultural Education”. I completed the thesis in August 2007, so it is already a bit dated by now, but it took me so long to get the needed approval to get it published online. I had the choice to either write the thesis in German and the abstract in English or the other way around and decided to go for an English thesis with a German abstract, both can be downloaded (in PDF format). I changed typoes and other obvious errors, but all else left the thessis as it was handed in. Edit: The thesis is now available for Kindle at amazon.com.